The Anthony & Me project is off to a good start. I checked in on Anthony on Thursday morning – he was bundled up at his corner selling the paper. He’s working on his to do list for our next check-in. I bought his latest edition of Street Sense, pushed some singles into Anthony’s glove covered hand and tucked the paper into my book bag. It was only today that I cracked the paper open to read through it. I thumbed it open to the first page where I saw an article by Editor-in-Chief Mary Otto. 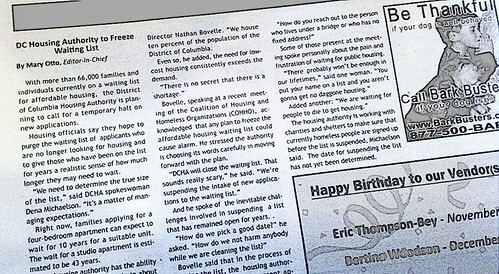 “DC Housing Authority to Freeze Waiting List” was printed at the top of the article. Fearing that this could hurt Anthony’s dream of housing, I read on.